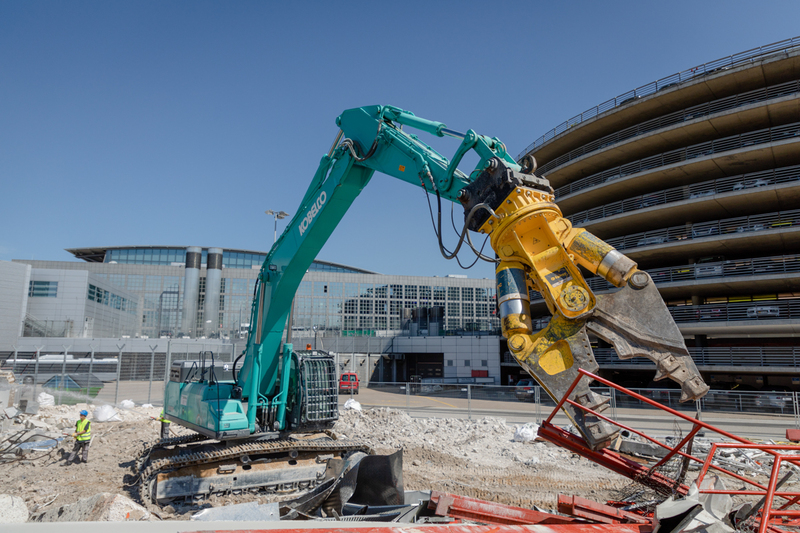 Ingolf Riebschlaeger - Kobelco Construction Machinery Europe B.V.
Hamburg is Germany’s second largest city, making its airport a busy transportation hub. In 2018, Hamburg Airport was awarded the title of Europe’s best airport in the 10-25 million passenger category – and it is still growing. Current extension plans to accommodate more terminals to support the growth of low-cost airlines, include demolition and redevelopment of old cargo and logistics buildings next to the existing main terminal. But, what appears to be a simple demolition job is made more difficult by the historic use of construction materials that are now classed as hazardous and require removal by specialists. There is also the need to control the dust that results from the demolition of thousands of tons of concrete. The effect of the dust on people is unpleasant, but the additional risk of dust and concrete particles entering the engines of aircraft on the ground or flying overhead pose serious danger. To remove hazardous waste like asbestos and contain the dust while working to a tight schedule required a specialist company. 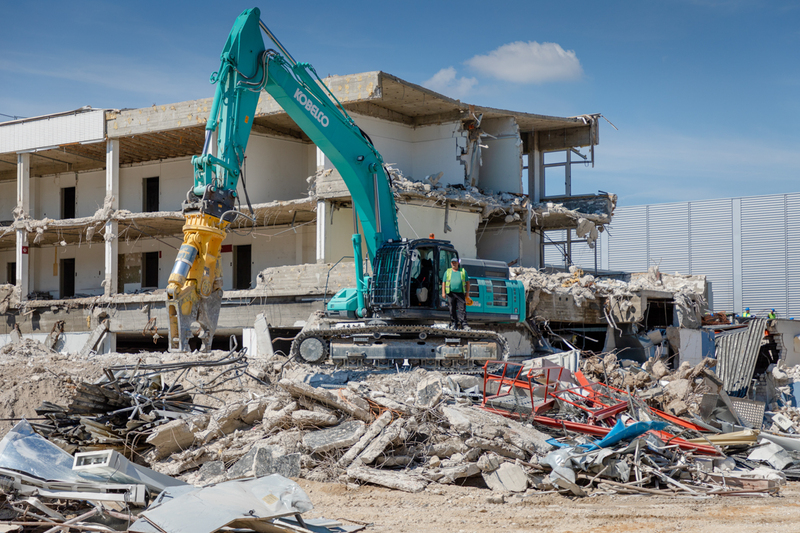 According to site manager, Torsten Klein, Bodo Freimuth Demolition & Recycling is the number one specialist recycling and demolition company in Germany; #7 in Europe and just outside the global top ten. The Bodo Freimuth group of companies employs 400 people and has a fleet of 400 machines that include front loaders, earth movers, rubble-crushing machines to recycle concrete, dozers and, of course, excavators. 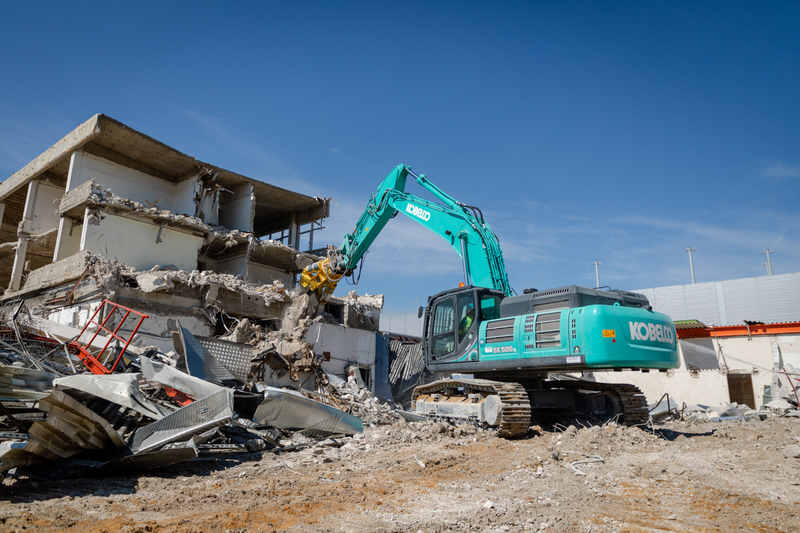 The most recent Kobelco excavator to be bought by Bodo Freimuth is a SK500LC-10, which joins three other SK500 excavators the business already owns. Ingolf Riebschlaeger is the man operating Bodo Freimuth’s new SK500LC-10. 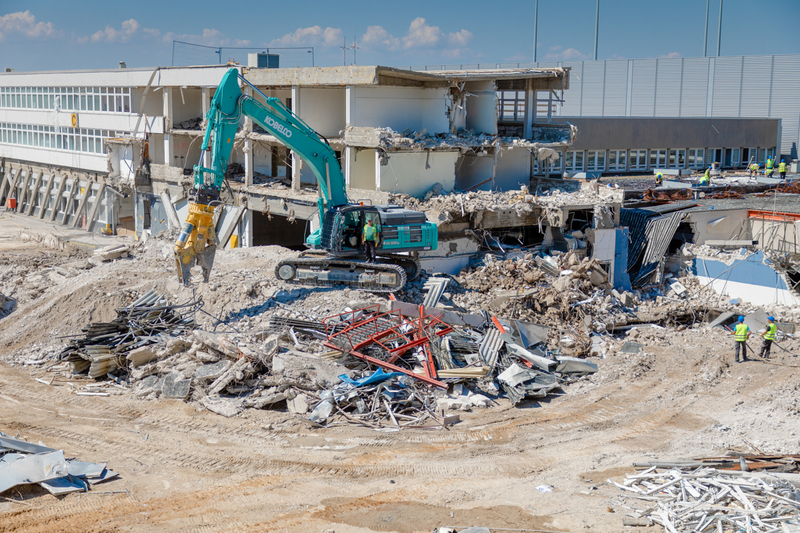 Aged 52, he has 38 years’ “on site” experience in the construction and demolition industry, using all types of heavy machinery including excavators from many manufacturers. 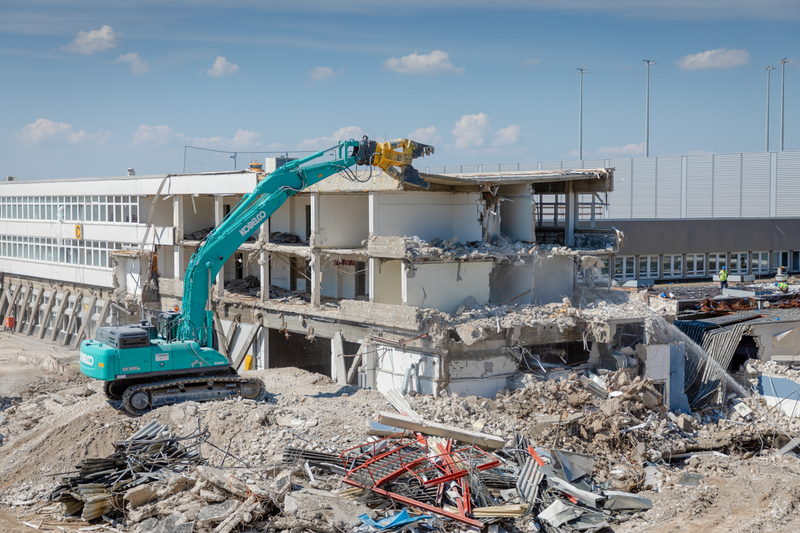 On the Hamburg Airport site, Ingolf uses the power and reach of the new SK500LC-10 to tear down concrete building structures with the addition of a 5-ton nibbler attachment that can easily grab, tear, lift and move anything from concrete flooring to steel beams. This particular machine has 10 pre-set settings to work with a nibbler and another 10 pre-set settings to work with a breaker. The pre-set modes allow the operator to use the correct flow and pressure. The attachment breaks large sections of concrete into manageable pieces to go into the crusher machine to be recycled as footings material. Extracting reinforcement bars and other metals is made to look easy. “Because of the nature of the work, I mostly have to use the Kobelco in H-mode – the crusher jaws are heavy and they require a lot of oil pressure to break the concrete. But even so the fuel economy is good,” says Ingolf. “The power of the Kobelco is very strong, very good” says Ingolf. “And so are the controls. They are responsive, which helps when sorting the different materials. I like the cabin… it is very good, exceptional when compared to previous competitor machines. It allows for easy access and is very comfortable.